Yes, you read that right. These 2 amazing sauces have come together to blow our minds even more. This sauce is a delectable, finger licking, umami bomb. A bit spicy, a bit funky with a hint of sweet. It is heavenly on most things, but in particular egg dishes and rice dishes. A great gift for the foodie in your life (you should treat yourself too!). A super cute Valentine’s Day present too! You could include a note referencing someone making you “weak in the knees” every time you are near them or “some hot sauce for a hottie”. Cheesy…yes…awesome…yes, that too. Made and bottled in Brooklyn, NY with locally sourced ingredients. Note: In order to help support this site, we are an affiliate of a curated group of companies and receive a commission on sales through those links on our site. Please be assured that we only recommend products we truly love. Take a look at our "Shop Partners" section to see who we have partnered with. Not all recommendations are from partner companies as we recommend all things we love regardless of whether we are partnered or not to bring you the best recommendations possible. The ultimate electric kettle - a must have for tea/pourover coffee lovers. Wonderful hostess gift this holiday season. The best honey around, plus gift sets and cheese pairings. Perfect to bring to any holiday gathering. Emergency Kits are essential yet always a such eye sores that it becomes hard to shell out the money to purchase them. And no way would you want to give one as a gift. That is until now! Let me introduce you to Preppi. Perfect for your home and as a cool and functional housewarming gift. Even in a tight NYC apartment, you can leave these stylish kits out in the open. The Preppi Go box would even be great for a kid going off to college or to include in a new car - it is always good to be prepared. Prices range from $445 - $95. From the source: The Prepster™ is our signature emergency survival kit featuring luxury comforts, tech gear, and first-aid essentials! You will find premium products from Malin+Goetz, TCHO Chocolate x Blue Bottle Coffee,Kusmi Tea, and Marvis toothpaste just to name a few! Even a Solar Powered USB phone charger for infinite power on the go. Available for One or Two persons, with or without a Custom Monogram! The beautifully designed leather and canvas bag is generously stocked with all of the necessary supplies such as Food, Water, First-Aid items and the proper tools to help you get through 72 hours following a major emergency. From $375 for one person, $445 for two - See Preppi for more details. From Preppi: The Prepster™ Lite is our trimmed down emergency survival kit for One Person. 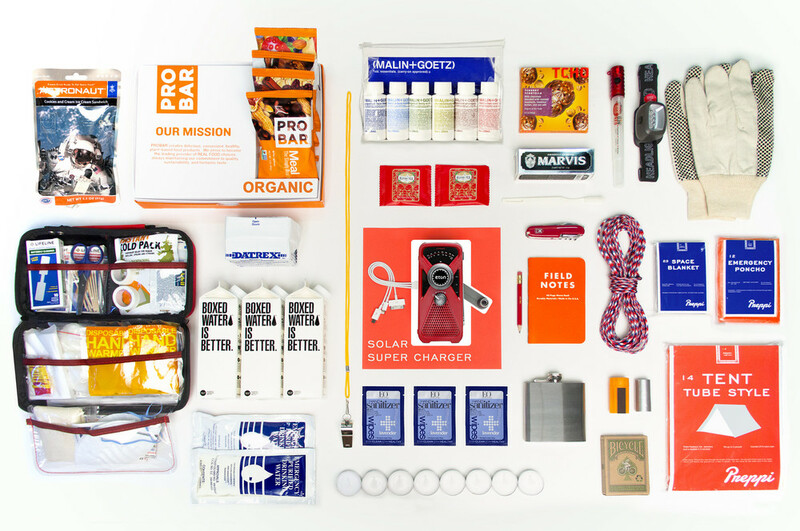 Stocked with all of the necessary supplies such as Food, Water, First-Aid items and the proper tools to help you get through 72 hours following a major emergency. Also includes premium comforts — a TCHO Chocolate, Kusmi Tea, and Marvis just to name a few! There is even a radio and LED flashlight! From $145 - See Preppi for more details. $95 - More details at Preppi. From the source: The Preppi Go Box is our compact Emergency Kit for One Person. Contains all the basic survival essentials in a handsome suitcase handle box perfect for any bookshelf or automobile! All images are from Preppi. We are not affiliated in anyway to Preppi besides loving their product. Pop Chart makes amazing infographics which are a feast for the eyes and brain. I adore all of them. Each version focuses on a particular topic making it easy to find one that speaks to something you love or that would make an extra thoughtful gift. This one is perfect for any coffee lover. You can purchase THE COMPENDIOUS COFFEE CHART (24" x 8") from Pop Chart in a variety of options (print only, framed...). The PRINT ONLY version is $29. No room for a print? Get one in coffee mug form! THE COMPENDIOUS COFFEE CHART COFFEE MUG - $15. Everyone has experienced that moment where they are not sure which drink glass is theirs. You either pick one up and hope it is yours or go for a new glass. And as a host, this means going through many more glasses than you really need to. These markers put the end to that confusion and everyone will appreciate it. They are easy to use and the writing comes off easily when the glasses are washed. So, trust me, If you like to have people over you need these. They also make a very thoughtful and useful hostess gift! Available on Amazon for under $10 - Wine Enthusiast 3-Pack Wine Glass Writer Metallic Pen. Up the fun factor of any pie by making the pie in one of these with a hidden quote on the bottom only to be revealed as the pie is eaten. Quotes like "Eat More Pie" and "Nom Nom Nom" are sure to make anyone chuckle. Your guests will be delighted as the message is revealed. Attending a party? How cute would it be to show up to a summer gathering with a delicious pie in a pie plate the host can keep? Not sure what to bake? This super simple, yet very yummy pie, Key Lime Pie recipe. It is sure to please. If you don't want to spend so much on the pie dish, here's a classic glass one: Pyrex Glass Bakeware Pie Plate from Amazon. Disclaimer: We are an affiliate of Food52 and receive a small commission on any sales. But be assured that we only recommend products we truly love. Images above from Food52. If you drink tea often you need this tea maker. If you know someone who loves drinking tea, they need this tea maker. You'll be one of their favorite people it you make this a gift. I have now had this Breville One-Touch Tea maker for about 4 years and still love it. The only reason I have not used it daily since we moved to NYC 2 years ago is because I do not have the counter space in our NYC sized kitchen. But I do still pull it out when we have a group of people over for brunch. In short, with some water, some tea leaves and a couple button presses you can have a cup (or a few cups) of tea brewed at an optimal temperature and for just the right amount of time. The tea that results is great and you can keep remaining cups warm by the touch of another button. No more cold tea! Prior to this tea maker I'd have to boil water on the stove, pour it in a cup with a tea bag once it was boiled and then wait for it to steep. That is when I would often get distracted by my daughter or something else and inevitably leave the tea too long, often to the point of it being cold...and thus disappointing. This tea maker saves steps, produces stellar results and saves you from cold, over-steeped tea. If you have the counter space, it also looks nice left out, unlike many coffee makers. It is a must have. Available on Amazon for about $220. Buy one, you or the giftee will not be disappointed. One of my Christmas presents from my amazing husband was a Breville One-Touch Tea Maker. I had mentioned that it would be nice to have an electric kettle with a timer so I could have hot water waiting for me when I woke up in the morning for my urgent first cup of tea. But I have to say that originally I was apprehensive about this tea maker. I love tea and thought I had a good thing going with my electric kettle and good, strong English tea bags. I got a nice cup of tea each time and didn’t have to deal with measuring out loose leaves or knowing steep times, etc. Simple, yet satisfying was a good thing. The Breville Tea Maker had lots of buttons and configurations, and while I love technology, I want getting my perfect cup of tea to be simple. But boy did my mind change quickly! It took just one use to turn me. I know think every tea lover should have one. Really!!! select what kind of tea you are making (black, green, oolong, etc) which sets a brew temp for you and then select how strong you want it (mild, medium, strong, custom) which sets the brew time, then hit the brew button. or you can do what I’ve been doing, which is going by the recommendation on the tea I have. Conveniently, the tea I had included a recommended brew temperature and time. Select a type of tea that matches the recommended brew temp (currently 195 degrees for my black tea, which is the oolong setting) and a tea strength that equals the high end of the recommended time. ﻿Then hit the brew button. If those steps sound complicated that’s my fault, because they aren’t. The 1-3 button presses become second nature very quickly. It also remembers your last settings, so if you are having the same kind of tea all you’ll need to do is press Brew once you’ve added the water and tea leaves. The kettle then very quickly heats the water to the proper temperature and then gracefully lowers the basket holding the tea leaves into the hot water. It is kind of neat to watch. It steeps the appropriate time and then the basket moves back to the top of the kettle, out of the water, leaving you with perfectly brewed tea that you can just pour out of the carafe into your cup. If you have made more than enough for one up for yourself, then you can simply return the carafe to its stand and hit the keep warm button! It will stay piping hot until you are ready for your next cup. Amazing!! I usually have a couple cups of tea in a row and this lets me brew them both at once and keeps the second cup hot while it waits for me, versus either making it cup by cup or in a teapot which never keeps the tea hot enough for me. And the tea is divine. I guess brew temps and times do matter! I had just been boiling my water till my electric kettle said it was boiled (or until my stove top kettle whistled) and letting my tea steep until I managed to return to finish making it. I also made a single cup each time. Meaning, each time I’d boil the kettle, I would have get to the kettle before the water cooled down too much, pour it into my cup with my tea bag, leave while my tea steeped and then try to get back to it before it got cold. I’ve had to dump out many cups of cold tea – if you have a toddler you’ll understand why getting back to finish making a cup of tea just can’t always be a priority. With the Breville tea maker, all the work is upfront and simple with great returns. You set it up and it beeps when your tea is ready, and perfect. I also like that it may save on energy a bit since I’m not boiling more water than I need every time. And, it does have a timer! I haven’t used it yet but plan to soon so I can have tea brewed and waiting for me when I get up in the morning! I get a little giddy just thinking about it! Clean up is a breeze too. Just rinse it out! For the most part, that is all you’ll need to do. If you’ve spoken to anyone who is old school about brewing tea they never washed their teapot. So most times I just rinse mine out – thoughtoughly, of course. But I do feel the need to also wash it from time to time, so maybe weekly I’ll pop the tea basket in the dishwasher and handwash the carafe (you can’t get water on the bottom side of it where it connects to the heating element). If you do need just hot water, then that is just a button press away as well. Yes, it is on the expensive side, but it is completely worth it. It is incredible. So, if you love tea or you know someone that does, run out and buy this tea maker now. Now! Copious amounts of love will follow. ….and get some nice tea to go with it. Any tea shop will be more than happy to offer you recommendations if you are unsure of what to try. There is also a video about it on the Williams-Sonoma site. This wood flatware and napkin holder is a bit pricey, but it is also gorgeous, super functional and will last years to come. We used it over and over again for numerous gatherings both in and outdoors. It makes putting out napkins and silverware a breeze and straightforward for guests. Ideal for anyone who likes to have people over, especially outdoors. Makes a lovely housewarming or host gift. Food52 just added the option of bass handles. So you can select the size you want, the wood you want and then whether or not you want to include bass handles. Comes in 4 options: Small Walnut, Large Walnut, Large Small Fumed Oak and Large Fumed Oak with or without handles. Per Food52 -- This might be the best way to hold your napkins, forks, spoons, and knives when you’re entertaining. The large size of this beautifully handcrafted holder has a section in the middle perfectly sized to hold your dinner napkins, along with 6 smaller sections for all of your flatware. The smaller size nicely fits cocktail napkins in the middle and also has 4 smaller sections for your flatware. Leave the holder out all the time because it’s classic enough to match with everything—and it’s super functional: Sections are removable for easy cleaning and oiling. Below are some shots of the large fumed oak version in our yard, just before having friends over. We did not have enough to fill all the slots as we were just serving a cheese and charcuterie platter so I added a few small succulents which added a whimsical yet sophisticated touch. This wine chiller is amazing. Run it under cold water for a few minutes and it will then keep your bottle of wine cold for 2 - 4 hours. And let's face it, would any single bottle of wine even last 2 hours? You can even write on it with chalk to share the type of wine housed in it or anything else you wish. We have used it a number of times and are always amazed at the results. The interior is coated so moisture does not transfer from the ceramic to the wine bottle. The ice bucket in this line is also sleek and super functional.